Globetrotters, the world is waiting for you. We take care of your transaction fees. One card. One trading account. Full flexibility. And of course, we have all your questions covered. Depending on the type of card you are holding, receive quarterly 0.5% or 1% or your expenses. No transaction fees in the 12 currencies, no fees* for holding the card during the first year. Everything else you need to know is in the table below. *No transaction costs for currencies included in the card. Annual fee applies from the 2nd year. See the fee schedule and the General Terms & Conditions for more information. How do I use my multi-currency credit card? When making purchases in a currency which is included in the multi-currency card there are no additional fees. If you already have money in the dedicated currency, the amount you paid will be debited from your current balance at the 1st day of the following month. If this is not the case, there is no need to worry. At the 1st working day of each month the amount due will be debited from your most funded currency by applying the day’s advantageous Swissquote exchange rate*. If you wish to do the conversion yourself, you can still do so until the 1st working day of the following month. When making purchases in a currency which is NOT included in the multi-currency card, we will debit your account in your card's reference currency and fees will apply (1.5%). *This only applies if you have the Forex Reconciliation option activated in your trading account. This option is activated by default. If you deactivated the Forex Reconciliation option, the debit interest rates will apply. How do I get trading credits? Each time you make a purchase with your card, you get 0.5%/1% of the expense in trading credits added to your account. The trading credits will appear at the beginning of the quarter for all purchases made in the previous quarter. A trading credit is valid for three months. How is my monthly limit calculated? A margin is blocked in your trading account, in accordance with the limit defined for your credit card. The limit is calculated in your reference currency (e.g. CHF). If your limit is CHF 5,000, you need to have CHF 5,000 on your account or enough money in other currency to reach the CHF equivalent. For example, the limit of CHF 5,000 can be reached by having CHF 4,000 CHF and GBP 743 (= CHF 1,000). However, if the result of GBP exchange rate transaction does not equal CHF 1,000, the account needs to be topped up further until it does match the limit. Can I withdraw money in foreign countries? Yes, a fee of 3.5% or a min. of CHF 5 (or equivalent amount) will be charged. If you withdraw money in a currency you don’t currently own, the same fees apply. If your local currency amount is negative and you deactivated the Forex Reconciliation option of your trading account the debit interest rates will apply. What type of account do I need to have to order a payment card? You can order a Silver or a Gold multi-currency credit card with a trading account only. How do I activate my payment card? Your card will be activated upon your first cash withdrawal or transaction in a shop using a payment terminal that requires entering a PIN code*. * Exceptionally, some payment terminals do not interrogate your card limit on entering your PIN code. In this case, the card cannot be activated and you must try with another payment terminal or make a cash withdrawal. How does the contactless system work? Contactless payments can be made on any payment terminal with a contactless symbol, by simply holding your card close to this symbol. The contactless payment may be refused and you may be required to enter your PIN code if you have reached your contactless limit*. 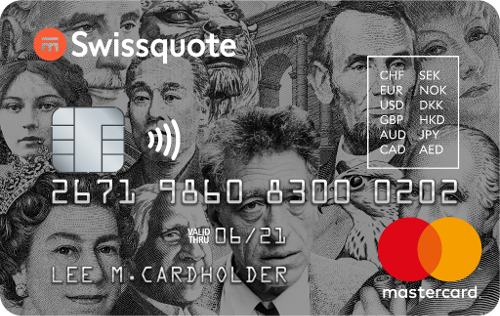 * The contactless limit is CHF / EUR/ USD 40 or equivalent of accumulated expenses made without entering your PIN code. Moreover, you cannot use the contactless method more than 10 times without entering your PIN code. The contactless limit is renewed once you next use your PIN code. For example, if you made two purchases of GBP 15 using the contactless method, you will not be able to make a new purchase for EUR 15 in this manner as your limit will have been reached. To continue making contactless payments, you have to enter your PIN code so the contactless limit will be renewed. What is the difference between an authorization and a transaction? The authorization amount can differ from the final transaction amount if the amount blocked by the seller is higher or if exchange rate or cash withdrawal fees apply. How are my purchases protected in Internet (3-D Secure)? Your online purchases are protected with 3-D Secure, the internationally recognized security standard for online payments by card. Lots of online stores offer 3-D Secure, and you will be invited to register your card to this functionality upon your first online payment that requires 3-D Secure. Once you have registered, you will then receive an sms code on your mobile phone to authenticate each online payment supporting 3-D Secure.